Component ID and pin ID or, instead, the label "VIA". The geometrical location, defined by x,y coordinates and accessibility code (top, bottom, both). A simplified description of the point shape: round (diameter, hole diameter) or rectangular (size, rotation). In the newer "B" version, test point geometry might be composed out of several basic shapes. The test points are located on THT and SMD pads. 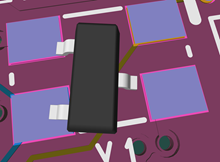 Not tented vias may also be included, of course without the component and pin identification. Points having the same netlist name are supposed to be electrically connected. The IPC-356 file is a popular export option, available from virtually all ECAD packages, along with P&P , BOM, drill and layer Gerbers. 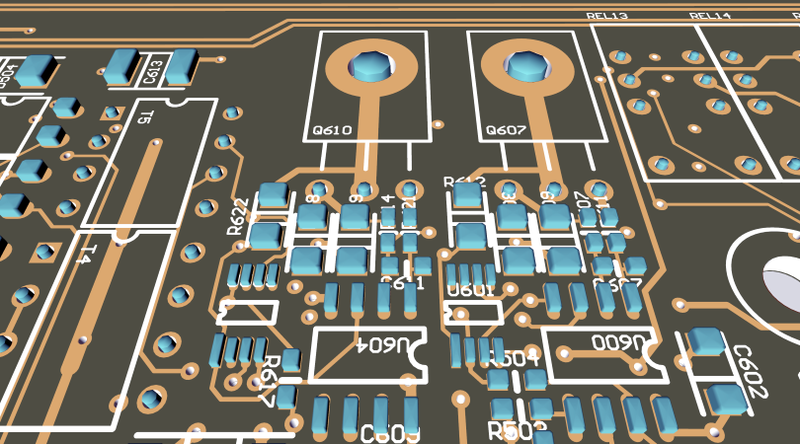 So, what can ZofzPCB do with it? 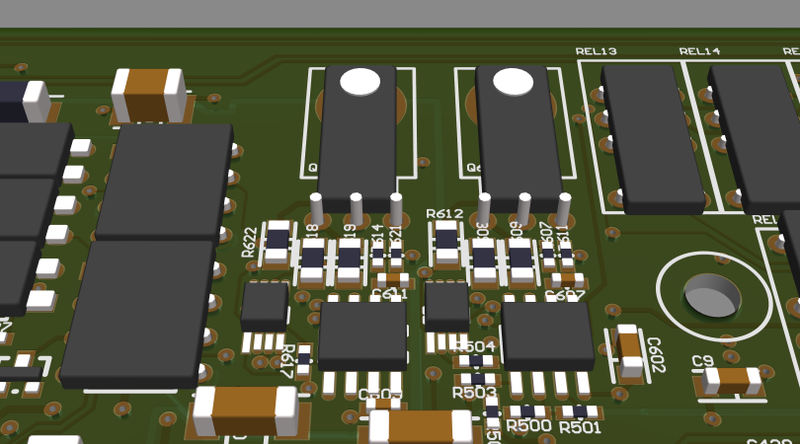 Netlist check, as with the real bare pcb, the 3d pcb model can be tested. In the same time, internal copper netlist nodes can be named by names from the IPC-356 file. Display every test point text data, when you place mouse pointer on it. 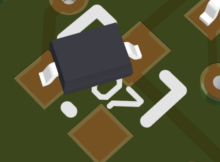 Every SMD pad and THT hole is named by component ID and pad ID. Display the test points - IPC-356 contains 2D geometry of the access point: round (diameter), rectangular (width, length, rotation). It is possible to group the test-points by component designator ID. 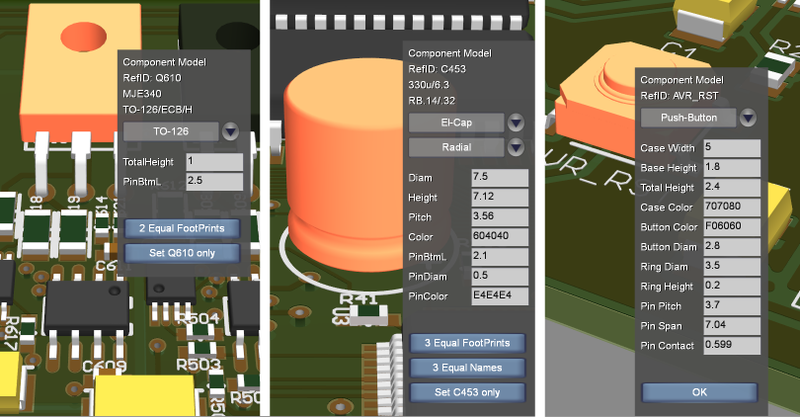 The result is a pin-out image for each component's footprint. This is the base for component shape modeler. The next step was to group testpoints by component ID, adding an extra box representing the component body. The trick is to determine the component box size, color, rotation and position. The body shape depends also on the designator text, in some cases. This functionality is available in the current software versions. This component model is called "extruded". The role of this Component Modeler is to provide mouse pointer targets, for components and pin browsing if you do not wish to obtain the real Component Modeler license. Also, it serves cases, where the parametric Component Modeler fails. First footprint geometry is classified on various aspects: number of pins, smd/tht, number of rows, heat sink pad, etc.. There are components tables, for each particular class. Component tables have various abstraction level. For example QFP are detailed, but e.g. 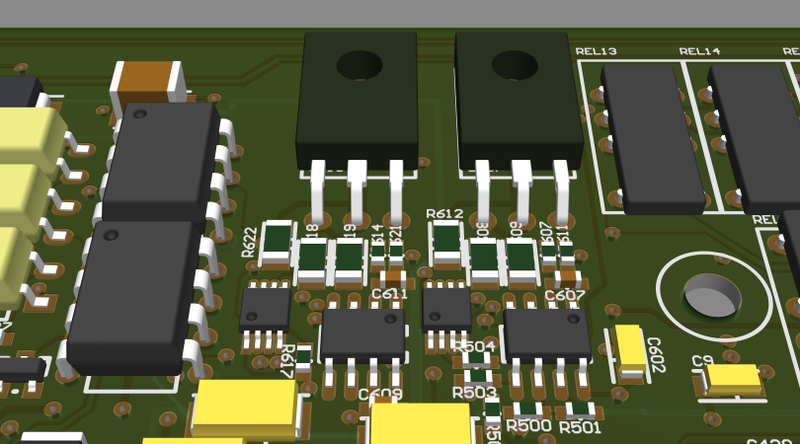 SO allow for variable pin numbers, 2-pin THT resistors are inherently versatile - all dimensions are adjustable so it can automatically fit in PCB holes. Unfortunately, at the moment, not all component case variations are present in the tables. Therefore I am thinking of moving the tables outside of the program, as readable csv files, making it possible to upgrade independently also by the user. For the mechanically featured components, like switches or connectors, adding STEP import or a simple component editor would also make sense. Not connected pads may be not listed in the file. The resulting footprint will not have complete number of pads. This is an optional setting of the CAD to CAM exporter and might be corrected, if there is a possibility of regenerating the CAM files. THT only footprints are defined as accessible from both sides, as their pads/plated holes really are. Therefore THT components side is not directly defined. THT components are assumed to be on the top side, by default. Effects of not connected pad being removed from the IPC-356 file. Please check the IPC-356 generation options. Bill of materials typically lists also the footprint. But it is hard to guess the case type from the footprint name. This depends very much on the library naming style. The component name or even component order number could be helpful, if I would use Farnell or DigiKey API. But also there, the case name from the distributor database is not consistent. So, for now, it is only used for info display, search, and changing multiple components, at once. Note that there is an automatic column detection, in the BOM file loader. It accepts formats where each component type is listed only once in the BOM, as well as formats, where each component have its own text line. BOM columns auto detection uses statistics and there are conditions, like very short list, when it will not work properly. I am trying my best, writing the automatic selection algorithm, but surly there will be a need to correct its results. Additionally, there still is a need to clear the top-bottom side ambivalence of the IPC-356 file. Components model and parameter values can be adjusted either by component search dialog or by the right-click menu. The selected options are saved in the .camset and in the .zofzproj file, for your convenience. As some IPC-356 files do not keep standard scale, I also need a Gerber file companion, along with IPC-356, because of automatic scale check/adjustment. If there are THT components, drill file would be also needed, since some IPC-356 files do not express the drill diameter correctly. The Gerber file must use "flash" commands for, at least, some percentage of the pads, to match it with IPC-356 testpoints and drills. The same matching procedure is needed for the drill file, because of the same frequent neglecting of the excellon standard scale rules. At the moment viewing the IPC-356 alone is not advised. Why not the pick and place file? P&P file contains only centres and sometimes pin "1" position for each component. There is no information on the pin out geometry, except a usually cryptically composed and non standard footprint name. Therefore, an excessive library of components would be needed, to reconstruct the footprints and 3D component models. The assignment and position correction procedure would be annoying and time consuming. On the other hand, as mentioned above, IPC-356 contains pinout geometry for each component. This allows me to create ad hoc 3D representation, in a simple (extruded) or elaborated way, by using more abstract software components models.